Description - The raccoon is a reddish-brown above and black or greyish below. The most prominent characteristics are the bushy tail with 4-6 black or brown rings and the black mask outlined in white. The ears are small and the feet and forepaws are dexterous. Distribution - This animal is native to the southern part of the Canadian provinces and most of the United States. It is most common along stream edges, open forests and coastal marshes. Biology - The raccoon inhabits hollow trees and logs for homes and often use the ground burrows of other animals for raising their young or for sleeping during the coldest part of the winter months. An average of 4-5 young are born in April-May; the mother at first carries them by the nape of the neck like a cat; they are weaned by late summer. Omnivorous, it feeds on grapes, nuts, grubs, crickets, small mammals, birds' eggs and nestlings. Often seen washing their food, the raccoon is actually feeling for matter that should be rejected as the wetting of the paws enhances its sense of feel. 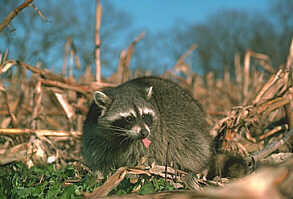 Winter is the raccoons greatest enemy when food is scarce. Tracks - The tracks of the raccoon are paired, having one rear foot beside one front one. The raccoon has five toes and usually the claw marks are evident in the print. The hind foot makes a print in which the toes and heel pad are joined whereas the front tracks toe and heel pad have a brief space between. The print vaguely resembles that of a miniature bear.